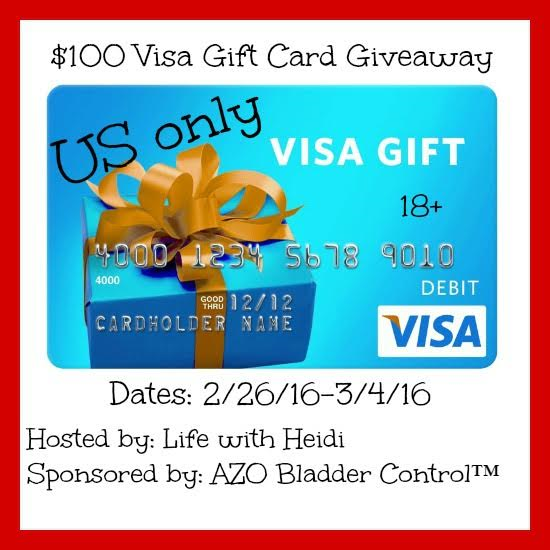 Welcome to the $100 Visa Gift Card Giveaway sponsored by Azo Bladder Control. If you haven't had a chance to read about it, check out the post on Life with Heidi. You must be a resident of the US and 18 years or older to join. Be sure to get your Azo COUPON: A $3 off AZO Bladder Control with Go-Less® formula coupon will bein a free standing insert in newspapers this Sunday, February 28th! For women in America with occasional urgency issues, “I’ve gotta go!” has a completely different meaning. AZO Bladder ControlTM with Go-Less® can help these women enjoy everyday activities, like a night on the town, uninterrupted. To celebrate this, and raise awareness of this common struggle, Azo is going to treat one luck winner to a night out! a Rafflecopter giveaway Giveaway Details Must be 18 years old or older US residents in order to win. Dates will be 2/26/16-3/4/16 (at midnight) Winners have 24 hours to claim their prize via email. Life with Heidi is responsible for shipment of the prize not the individual blogs helping promote this event. Disclosure: The opinions expressed are my own and may differ from yours. Sweet Cheeks Adventures is not responsible for prize shipment and didn't receive any compensation for this post. For questions concerning this giveaway or to host your own giveaway please contact smslwithheidi@gmail.com. Make sure you get entered for your chance to win all of these great giveaways too! Preferably I'd spend it on a quality grocery shop & return home to cook together. Maybe some binge watching as well.